Does abstract art fail to evoke a profound emotional response? Try viewing it while you’re terrified. Are you puzzled by Picasso? Perplexed by Pollock? Do you feel you’re missing out on something profound when friends discuss their intense reaction to abstract art? You could do some research to better understand what you’re looking at. Or you could turn off the lights and watch a DVD of Psycho. A newly published study finds people are more likely to be moved and intrigued by abstract paintings if they have just experienced a good scare. This suggests the allure of art may be “a byproduct of one’s tendency to be alarmed by such environmental features as novelty, ambiguity, and the fantastic,” argues lead author Kendall Eskine, a research psychologist at Loyola University New Orleans. “Artists may be tapping into this natural sense when their work takes people’s breath away,” he and his colleagues write in the journal Emotion. Their study was inspired by 18th-century philosopher Edmund Burke, who argued there is a strong link between fear and our experience of the sublime. To test this thesis, the researchers conducted an experiment featuring 85 Brooklyn College students. Participants were randomly assigned to one of five conditions: fear (which was evoked by viewing a brief frightening video); happiness (evoked by a watching a brief pleasing video); high physical arousal (they performed 30 jumping jacks); low physical arousal (15 jumping jacks); or a control group. This makes sense from an evolutionary perspective, according to Eskine and his colleagues, Natalie Kacinik and Jesse Prinz. “The capacity of a work of art to grab our interest and attention, to remove us from daily life, may stem from its ability to trigger our evolved mechanisms for coping with danger,” the researchers conclude. While these results support this thesis, it’s important to acknowledge that our reaction to art depends upon a combination of factors. As the researchers note, specific cultural cues and personal predilections play a role in whether we find a work breathtaking or boring. But this study suggests there’s also something more basic going on when a work of art really grabs us. The sight of a menacing figure in a dark alley can give us goose bumps; under the right circumstances, so can a poem or a painting. Perhaps the best way to approach a Rothko is with sweaty palms. New research finds even nonexperts can differentiate between masterful abstract art and similar works painted by a child or an animal. See for yourself with our enclosed art quiz. New research from Vienna finds viewing artworks in a museum enhances the aesthetic experience. A study of 9-month-old babies found they prefer the brighter paintings of Picasso to the subtle shadings of Monet. 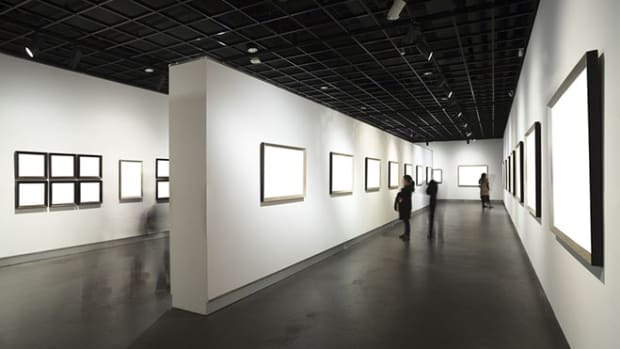 Surprising new research suggests non-experts’ receptiveness to modern artworks may be lessened when contextual information is presented. From Vincent Van Gogh to Lady Gaga, we tend to like artists’ work more if we perceive them as idiosyncratic. Why do people visit art museums? The answer depends on the type of art on display.